A rare Chinese vase is set to return to China after it was sold to a Hong Kong buyer for GBP 1,482,500. 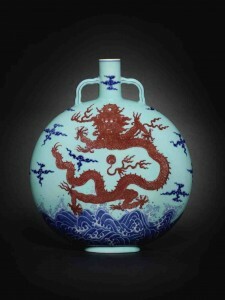 The so-called dragon moon flask, said to have been made for the Qianlong emperor and hidden for a century, was sold at Bonhams auction house in London 7 November 2013 for GBP 1,482,500, one of the highest prices achieved for any object in this year’s Asian Art Week auction sales. It was bought by a Hong Kong buyer and so it is returning home, Bonhams said. The turquoise vase with a rampant red Imperial dragon was estimated to command a price of GBP 500,000-800,000 “because of its rarity, beauty, and its Imperial provenance,” the auction house said. Enthusiastic bidding from Bonhams’ crowded new salerooms in New Bond Street saw the price soar beyond that estimate. The flask is one of less than five such vessels known to have been made for the Qianlong emperor (pictured), who reigned from 1735 to 1796. A connoisseur of ceramics, the sixth Qing emperor presided over one of the most productive periods in Chinese art production. The flat-sided full-bodied flask, round like the moon (hence its name ‘moonflask’ in English and baoyueping or bianhu in Chinese), is also traditionally known as a ‘pilgrim’s flask’ in the West. It takes its form from a Middle Eastern prototype for water flasks, often carried by travellers at that time. The auspicious five-clawed Imperial dragon flying amidst clouds follows a traditional design dating back to the 14th century. “This has been a fantastic way to inaugurate the new London saleroom with such a magnificent object achieving such a stunning price during Asian Art Week in London,” said Colin Sheaf, Bonhams deputy chairman and head of Asian art. Collected in China by Captain Charles Oswald Liddell (1854-1941), the vase was brought back to England by Liddell to his country house Shirenewton Hall, a Grade II listed house near Chepstow in Monmouthshire. The Liddell home provided a suitably impressive setting for this Chinese treasure, surrounded by parkland with views over the ‘Golden Valley’, the Bristol Channel and beyond to the Mendip and Quantock Hills. Captain Liddell was based in China from 1877 to 1913, running his family’s firm for more than three decades whilst also developing his eye for and knowledge of Chinese art. He was fortunate to be present at a crossroads in Chinese history, just as 2,000 years of Imperial power was ending and Imperial pieces were becoming available to Western collectors astonished by their beauty. On his return from China, Captain Liddell created a Japanese Garden and erected an immense 1.5 ton temple bell under a pagoda roof on the east lawn, reflecting his appreciation of Asian cultures. Flasks of this type are much sought after by the world’s leading museums for the extremely rare decorative style combining underglaze painting in cobalt-blue and copper-red minerals further enhanced by a fine translucent turquoise glaze. An artistic and technological triumph, it is expected to be fought over by the new generation of collectors emerging from China, eager to acquire a piece of Imperial history and willing to pay exceptional prices for such exceptionally rare treasures.